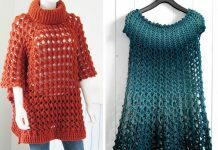 This Woolly Waves Sweater Crochet Free Pattern is a sweater that is perfect for giving as a gift. Make one now with the free pattern provided by the link below. This pattern is intermediate and takes a some crochet experience. This pattern also takes a while to make because the yarn used to make it is very thin. This sweater features a very cool pattern that is simple, yet elegant. The color transition adds a very nice touch to this sweater as well. 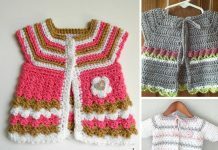 Thanks Hooked by Anna for sharing this adorable free crochet pattern.The link for the free pattern is provided below photo. Happy crocheting.